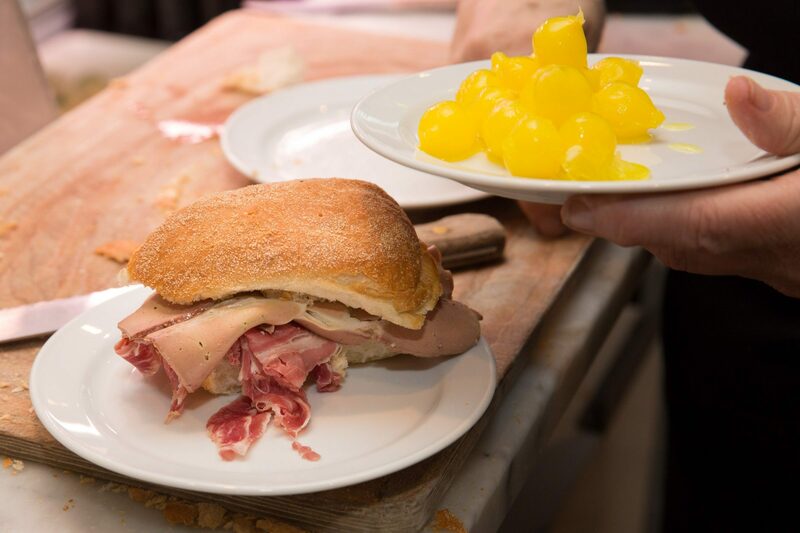 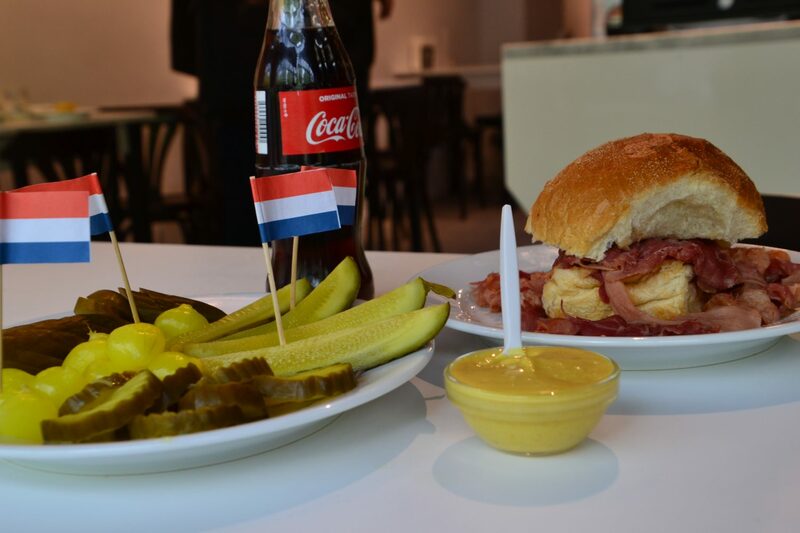 Before the war, Quiros sandwich shop was located in the heart of the Jewish Quarter in Amsterdam. 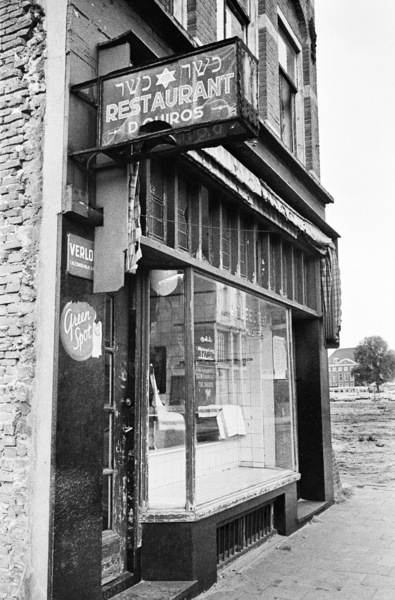 At that time it was, besides a restaurant, also a kosher butcher’s shop. 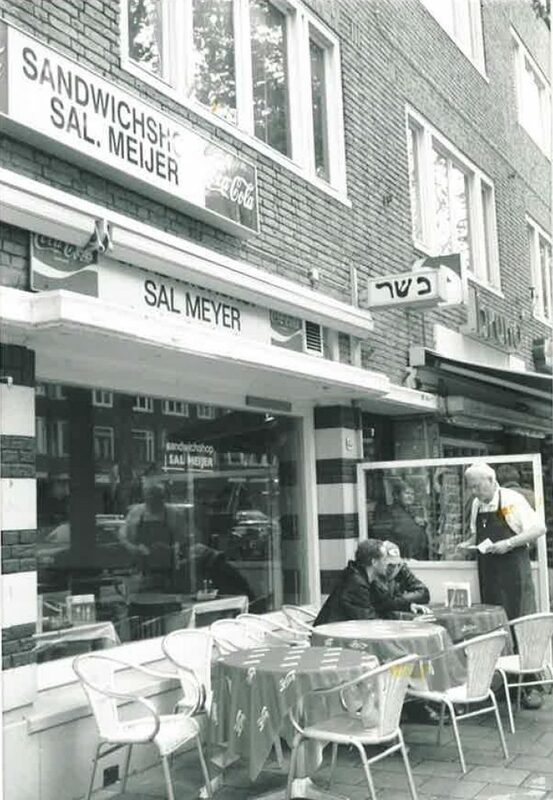 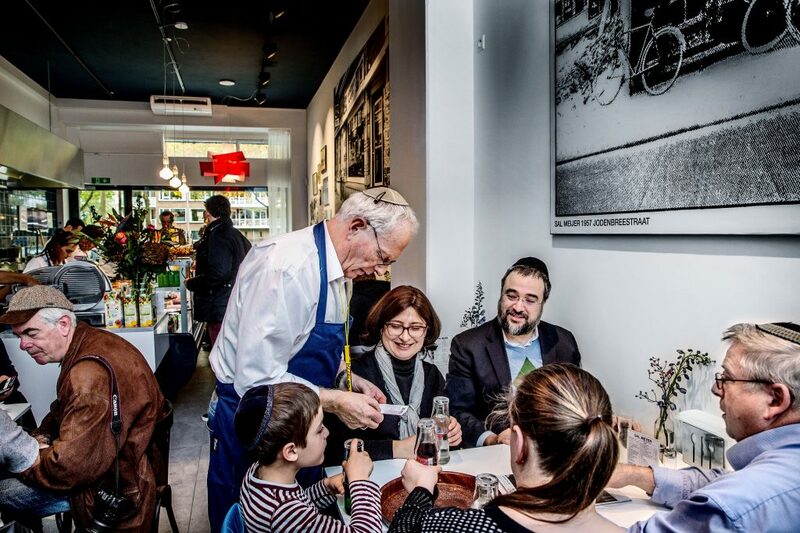 Sal Meyer took over this shop in 1957 and the restaurant soon became a meeting place for Jews. 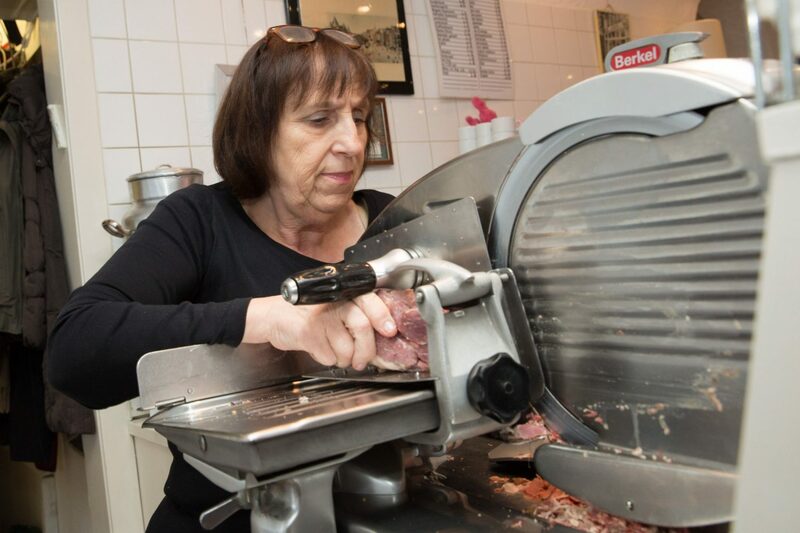 “Is there still the kosher sandwich shop Sal Meyer?”. 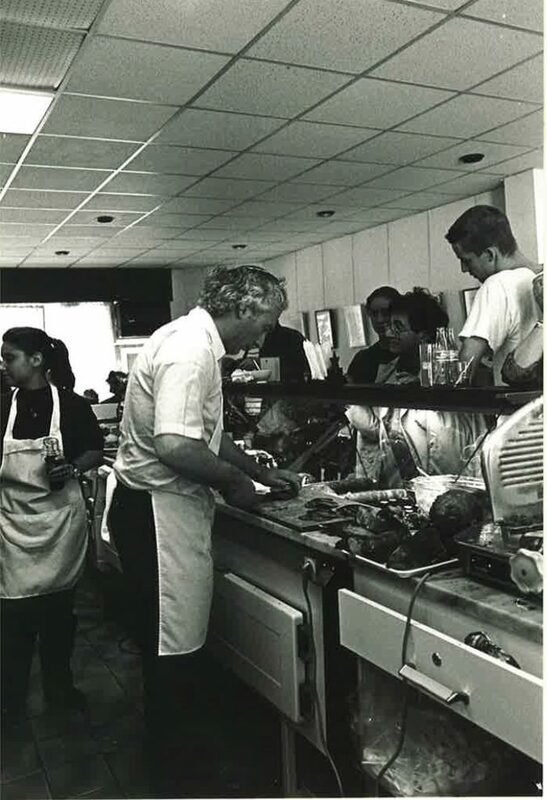 If you look closely you can see Sal Meyer preparing sandwiches. 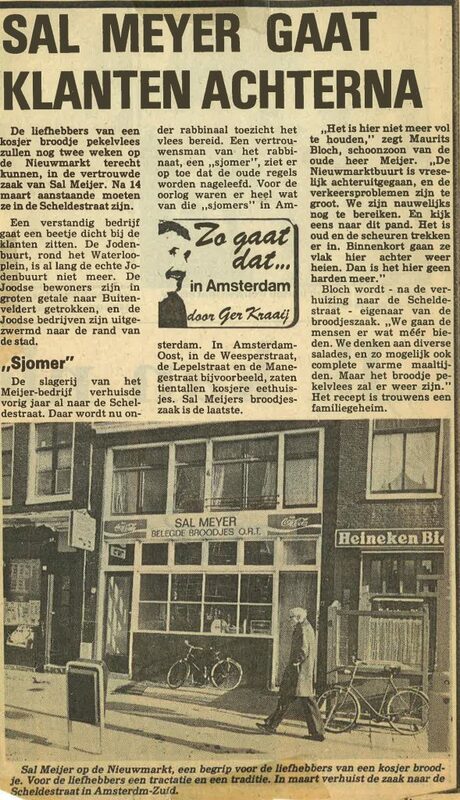 Sal Meyer settled here from 1957 to 1964. 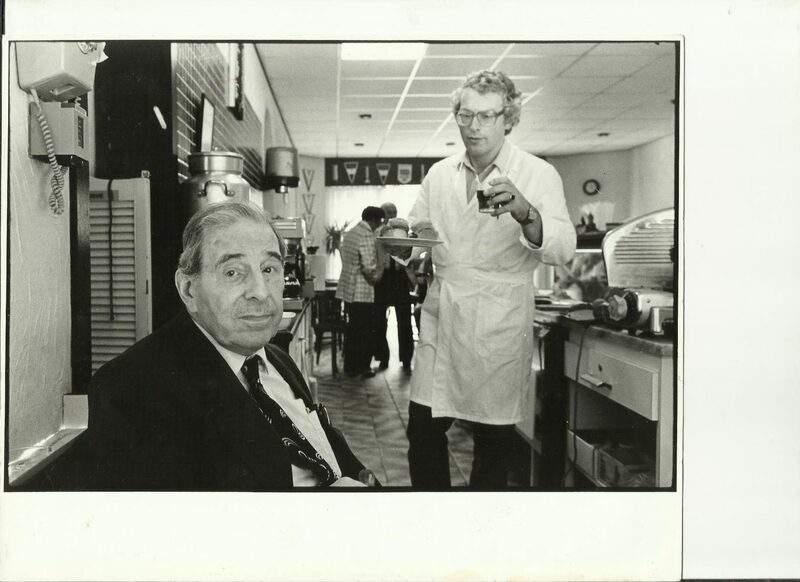 After Sal took over the restaurant in 1957, his son Nico joined the him in 1961. 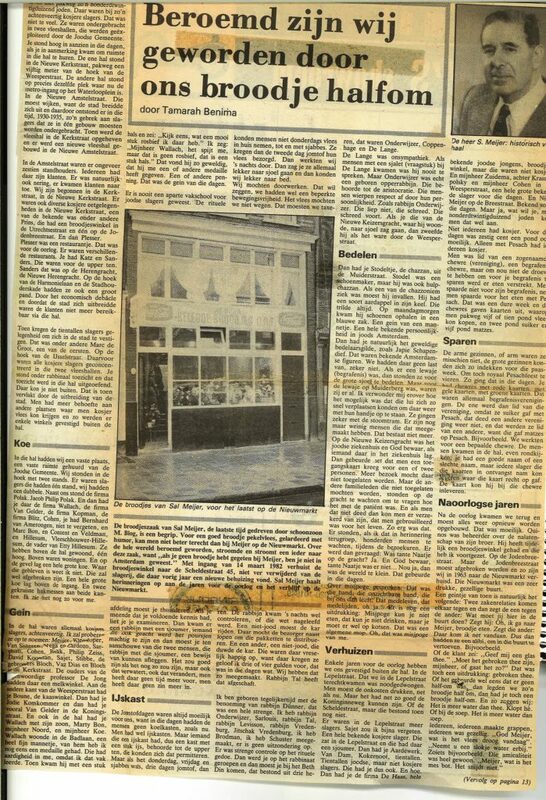 Due to the reconstructions of the building Sal decides to move to the Nieuwmarkt in 1964. 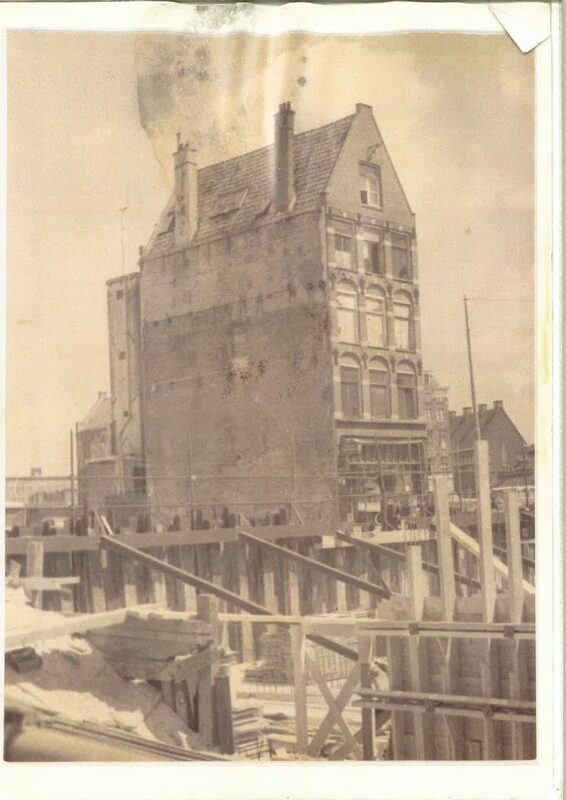 This photo was taken at the start of the new location at the Nieuwmarkt in November 1964. 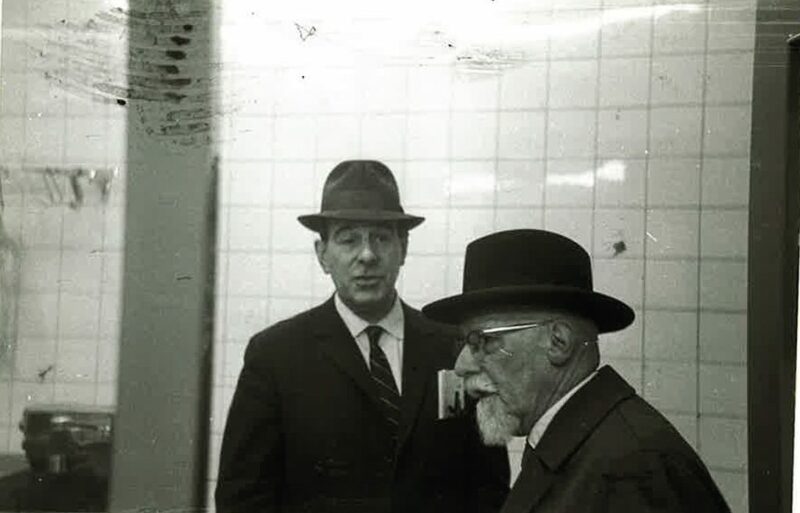 Sal Meyer and chief rabbi of the Portuguese ISR municipality (chacham). 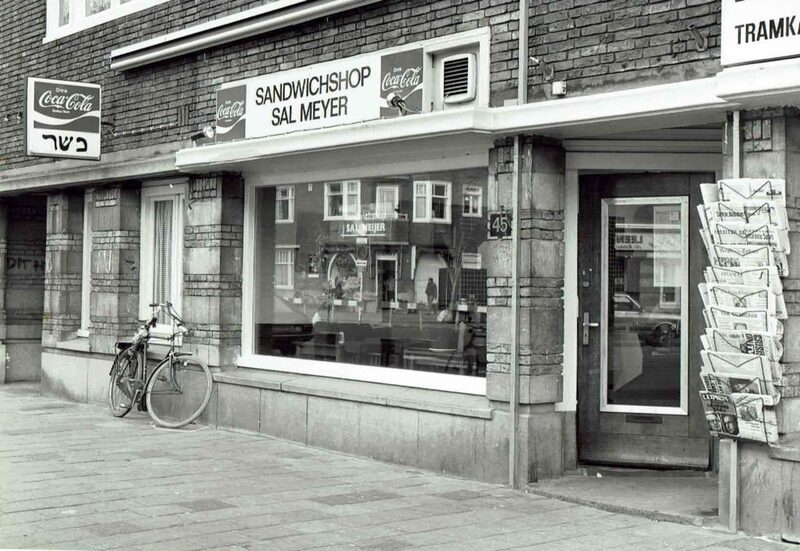 Soon the sandwiches started to get popular in Amsterdam and Â everybody was taking about “Broodje Meyer” (Meyer’s Sandwich). 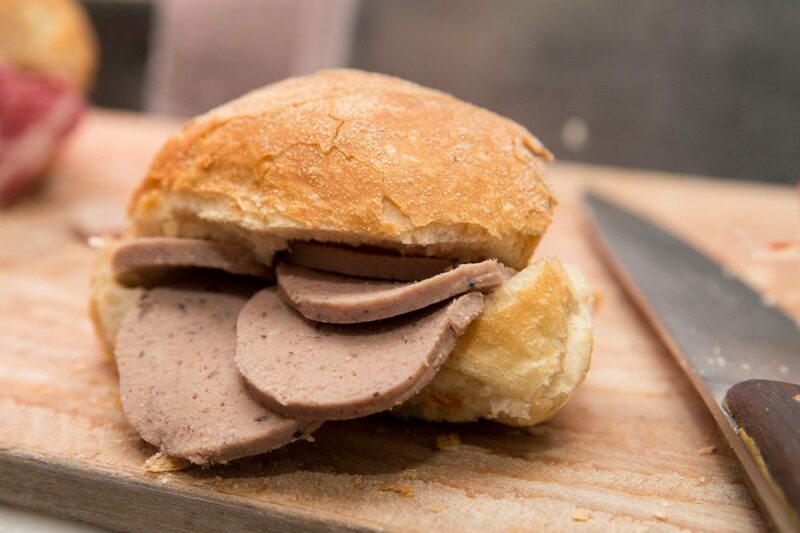 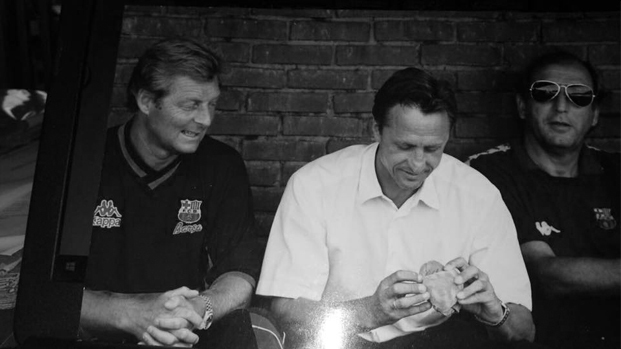 We became famous for our Sandwich with salted meat and liver combined (Broodje halfom). 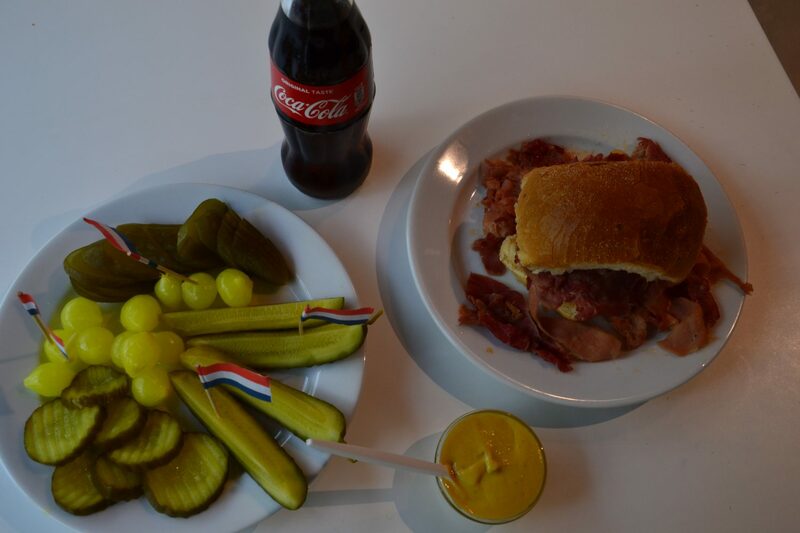 People came from all kind of places to experience what they had heard from others or as it once stood in the newspaper: “Somebody who is in Amsterdam and has not eaten meat from Meyer’s sandwich is the same as someone who comes to Amsterdam and without seeing Rembrandts’ painting The Night Watch. 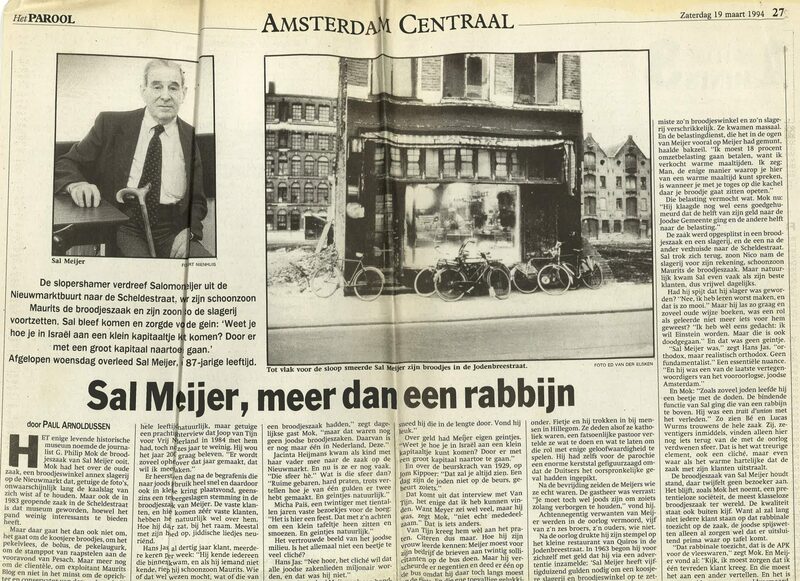 In 1981 Sal handed over the business to his son-in-law Maurits and his daughter Marjan. 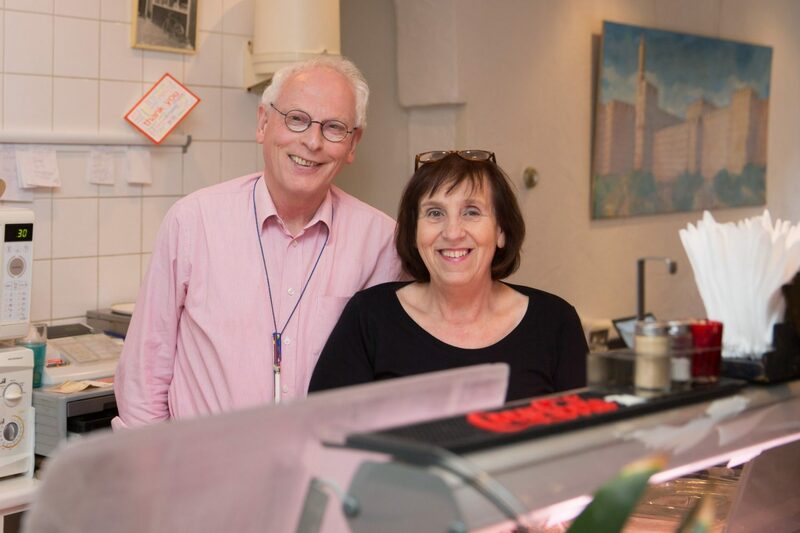 The couple worked for one year in the Nieuwmarkt and then moved to the Scheldestraat 45. 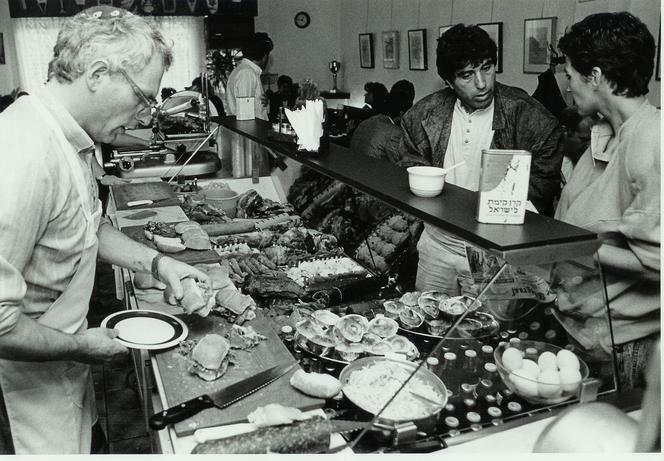 New homemade products like fish cakes and salads were added to the menu. 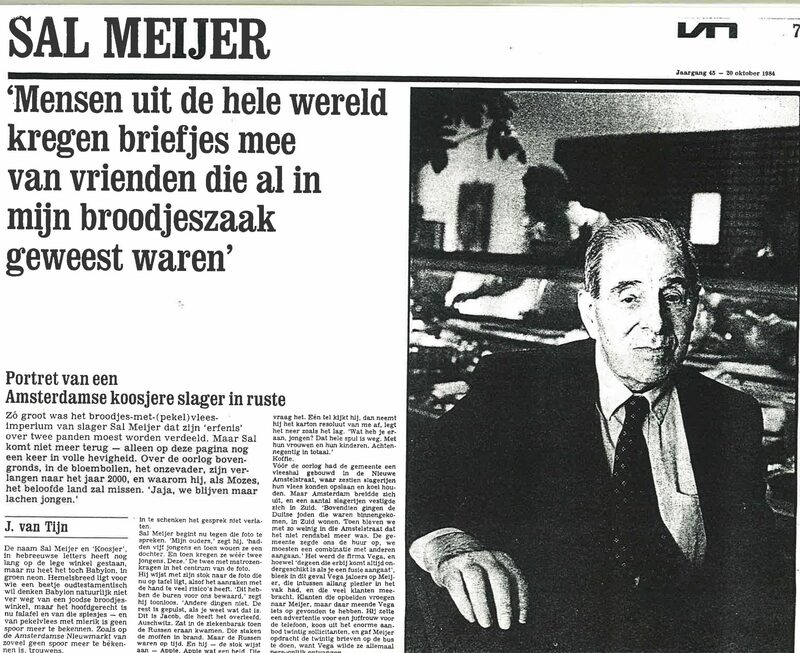 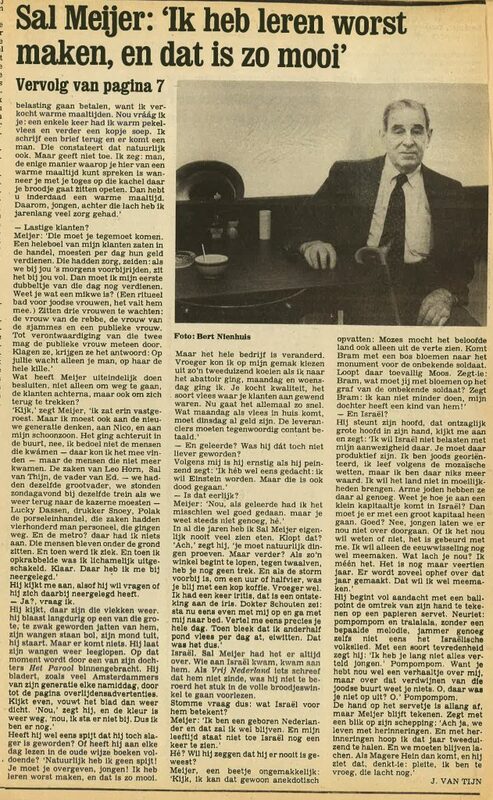 October 1984, interview Sal Meyer by Joop van Tijn of Elsevier. 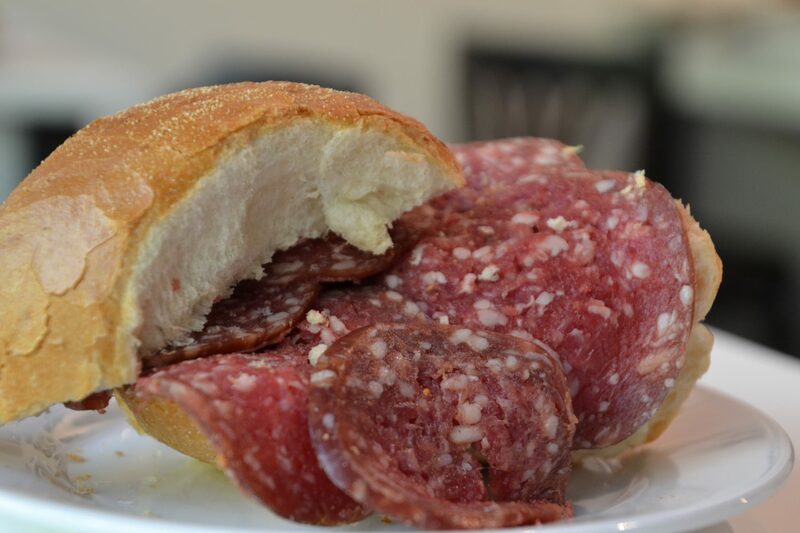 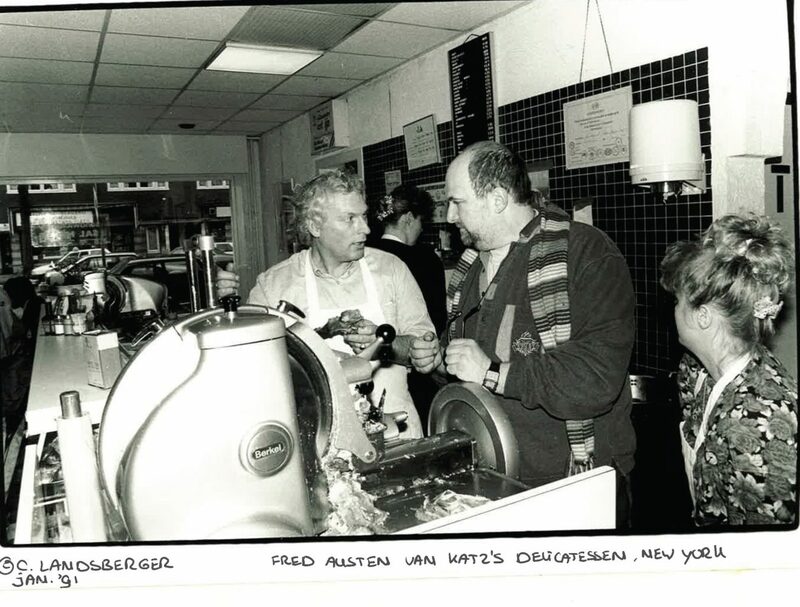 Maurits and Marjan succeeded in establishing a Sandwichshop that became famous in Amsterdam and abroad. 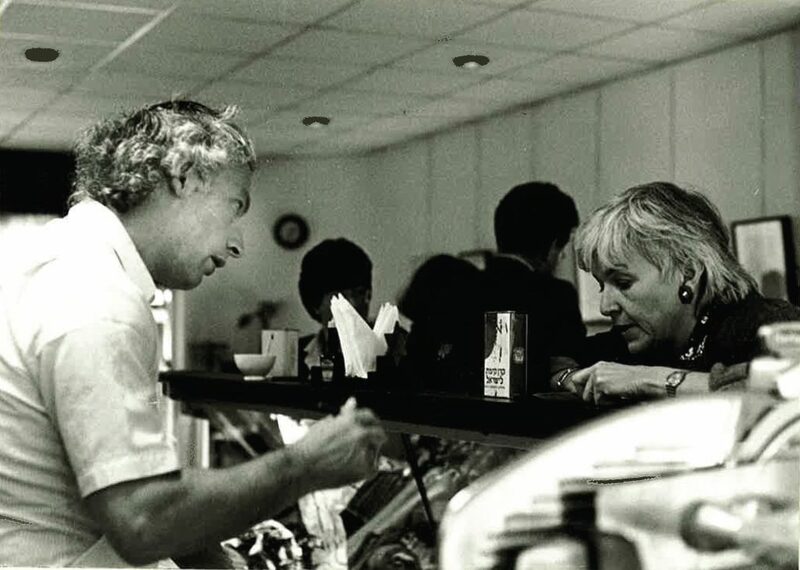 Always a good place to meet or have a chat. 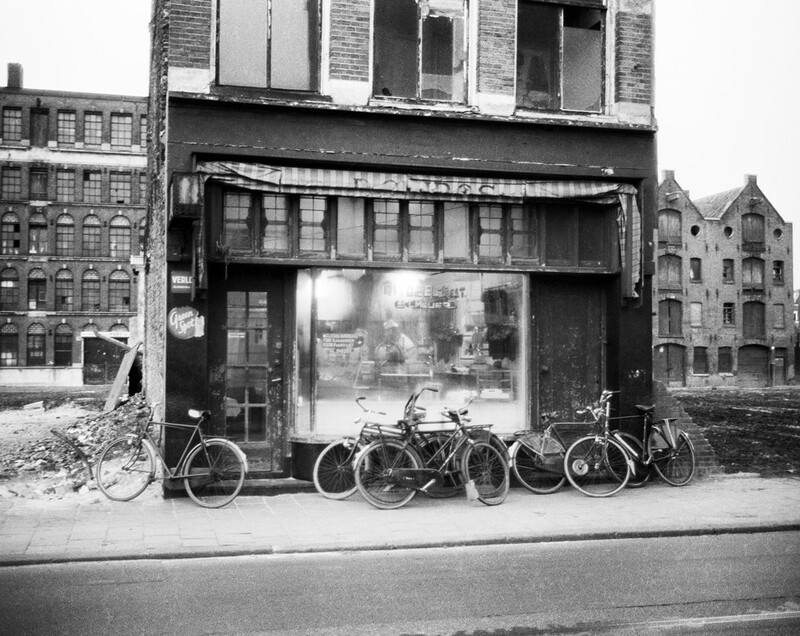 It’s was crowded on the last day in the Scheldestraat. 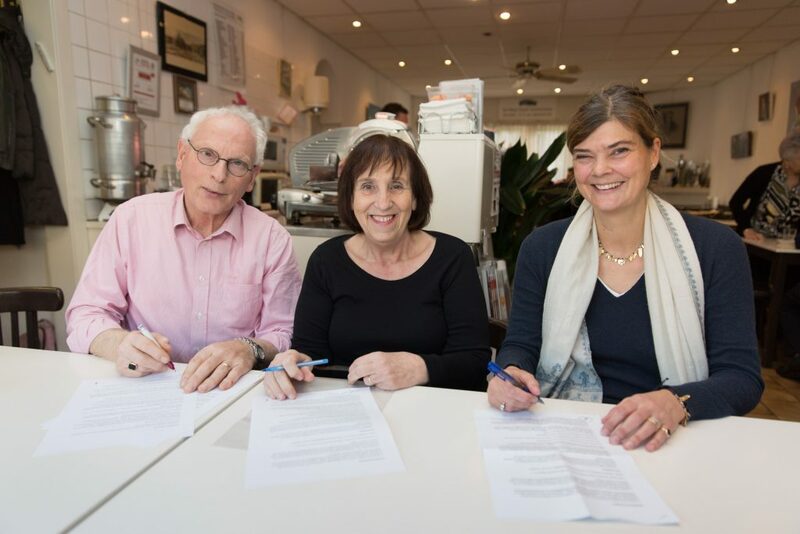 In December 2015 Maurits en Marjan Blog signed a contract with Claudia Koppert and handed over Sal Meyer to start at the Buitenveldertselaan 114. 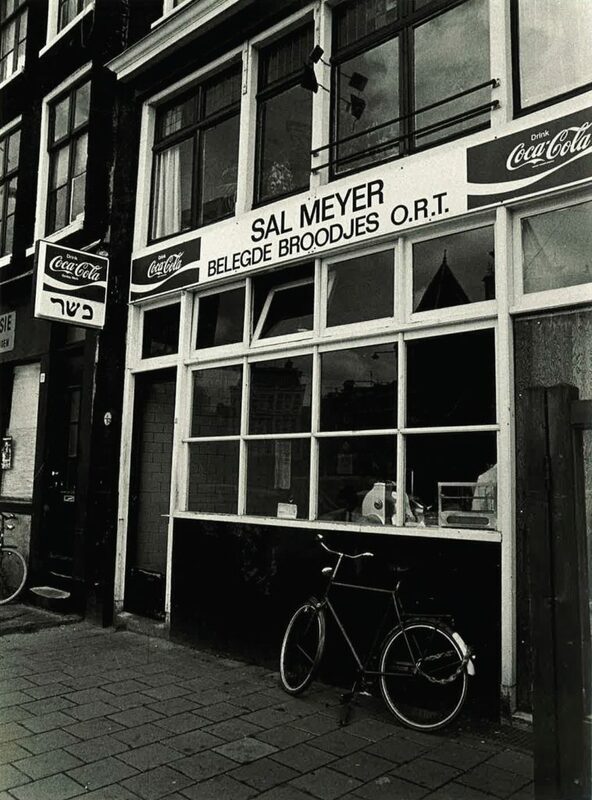 Sal Meyer opens again on 31 October 2016. 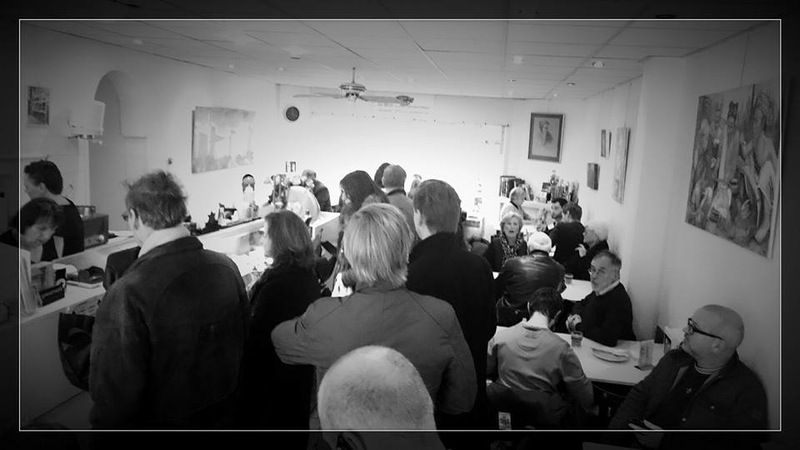 It was as if time had stood still for a while and many people came by to get a taste of the atmosphere. 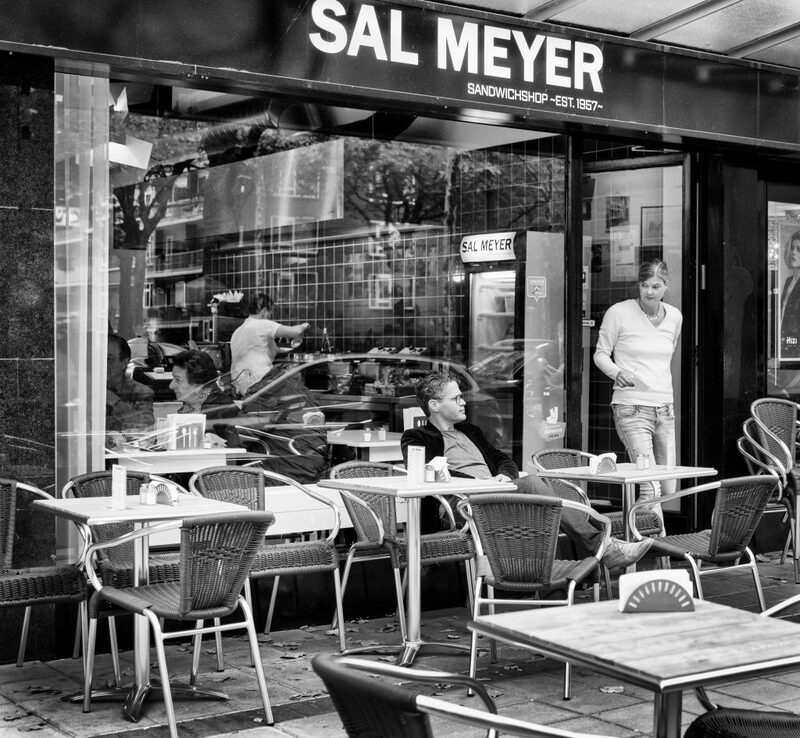 After sixty years Sal Meyer is doing very well. 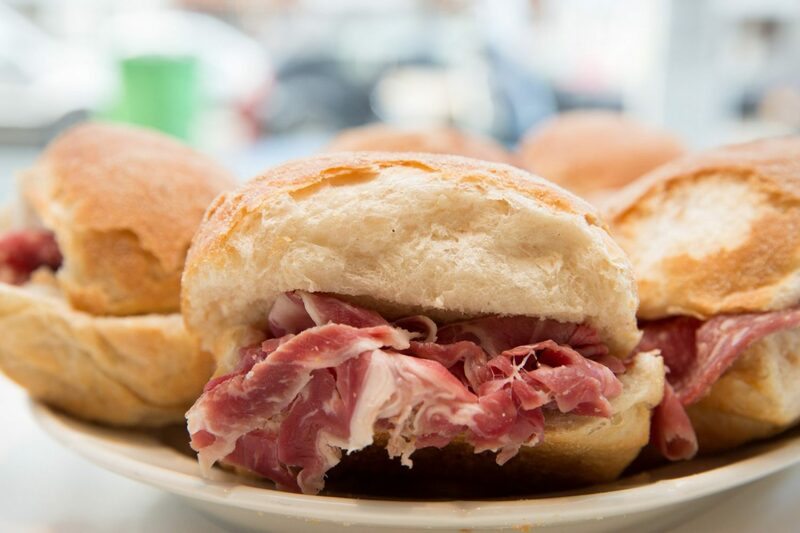 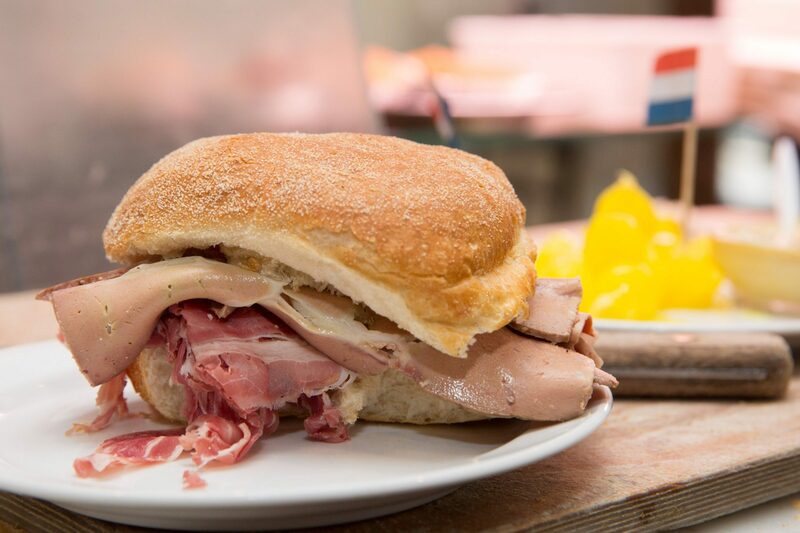 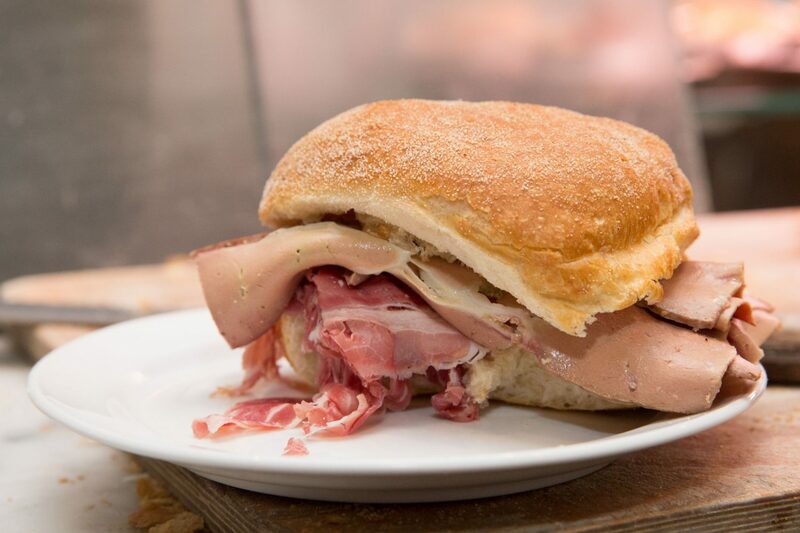 The sandwiches are still delicious and the atmosphere is as never been before. 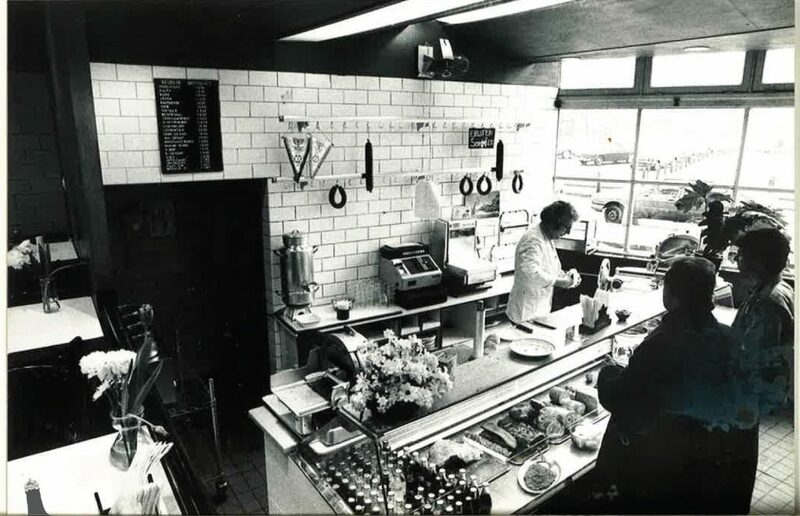 Customers also liked the improved parking facilities.